It was a decent Week 5 in terms of player/team props recommendations. I hit on Peyton Manning at +120 to have more passing yards in his matchup with Tom Brady and also on the fact that Mark Sanchez wouldn’t be benched in the Monday night game vs. Houston (-140) and that the Jets would finish with less than 320.5 yards (-115) vs. the Texans. 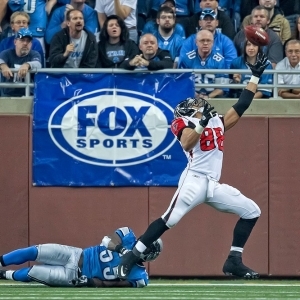 This week, let’s start with a look at Atlanta tight end Tony Gonzalez, who in every game these days makes it more and more evident that he’s the best receiving tight end in NFL history. The 36-year-old Gonzalez made some noise about possibly retiring after this season, but that’s hogwash. The future Hall of Famer leads the NFL with 39 catches. He leads all tight ends with 389 yards and is tied for the lead at his position with four touchdowns (also tied for second in the NFL). So much for Gonzalez being in the shadow of the likes of Rob Gronkowski and Jimmy Graham. No tight end has led the league in receptions since Gonzalez did in 2004 with 102 for the Chiefs. The previous tight end before that to lead the NFL in catches was Oakland’s Todd Christensen in 1986. Gonzalez’s 39 receptions through five games are the most in NFL history by a player 36 or older. The previous mark was 31 by Jerry Rice and Terrell Owens. Gonzalez also is one touchdown short of becoming the eighth player in NFL history with 100 receiving touchdowns. He’s the only tight end in NFL history with even 80 touchdowns. With that said, Bovada offers two Gonzalez props in Week 6: Will he lead the NFL in catches (“no” -500, “yes” at +300) and “over/under” 99.5 total catches this year (both -115). Currently Gonzalez is on a pace for almost 125 catches. But that’s clearly not going to happen as that would be second all-time in NFL history. To reach 100 catches, he would need to average 6.25 catches if he plays every game. Gonzalez does lead Atlanta with 47 targets, which is saying something considering Matt Ryan also has Roddy White and Julio Jones. I still have to take no on the prop and on the total catches. The guy is 36, as mentioned, so I would presume he might miss a game or two -- although he has played all 16 games in every season but two and in those he was in 15 games. But what if the Falcons clinch the top seed in the NFC in Week 14? Might the Falcons rest Gonzalez? Wouldn’t surprise me. Let’s move to another Tony: Romo. His Cowboys are at Baltimore this week in Romo’s first game since he tied a career-high with five interceptions in a loss to Chicago. If you watched that game, at least two weren’t his fault. Bovada offers a prop on Romo’s picks this week, with an over/under of 1 (both -115). Prior to the Bears game, Romo had thrown one pick in the previous three games. He had only two multiple-game picks last year and goes against a Ravens defense that has six interceptions so far. I lean toward under here only because I don’t think Romo tosses two – it probably will be a push. Meanwhile, after being mostly shut down in a Week 2 home shocker to Arizona, the New England offense is rolling again with at least 30 points in each of the past three games. In the past two weeks, New England has had 580 and 444 yards of total offense, respectively. Bovada offers an over/under on the Pats’ total offense this week at Seattle: 400.5 (under the -125 favorite). New England also has had three rushing touchdowns in back-to-back games for the first time in 34 years. There is a yes-only prop on whether the Pats do it again this week at +700. The Patriots go against a Seahawks defense that is No. 1 in yards allowed at 258.6 and No. 2 in points per game at 14.0. The Seahawks have allowed two rushing scores all year, so don’t take that prop. The best offense Seattle has faced this season is Green Bay, and the Packers totaled just 268 total yards in the memorable Monday night loss. It’s supposed to be a bit rainy in Seattle on Sunday afternoon (shocker!) and breezy. Sounds like a defensive game. Take the under total yards. I have yet to nail the highest-scoring team in a week this season – I liked New Orleans last week vs. the Chargers. The Saints finished with 31, but the 49ers won the week with 45 against inept Buffalo. Atlanta is the +450 favorite this week as it hosts Oakland. Not a big fan of the Falcons there since the Raiders had two weeks to prepare for that offense. I should just take whichever team faces the Bills, but I’m not going with Arizona (+800). I like Houston at +700 in what should be a shootout vs. Green Bay (+1200); frankly, I might put money on the Pack too because they are desperate and could well win, and they are great value at that price. For most passing yards, Aaron Rodgers, Eli Manning (vs. Niners) and Tom Brady are all +350 favorites. I do like Rodgers there, especially as the Packers won’t have injured top running back Cedric Benson. Rodgers could throw it 55 times. For top rusher, I like the Falcons’ Michael Turner at +800 vs. that Oakland No. 24 rush defense. And for top receiver, I am going chalk and taking Detroit’s Calvin Johnson as the +400 favorite vs. the Eagles.